Hardy in cold climates provided the plant is well-rooted and mulched. If desired, small plants can be potted up in autumn and grown through winter indoors. Sage, Cosmos, Monarda and Rose. Most other herbs that grow to more than 12 inches tall. 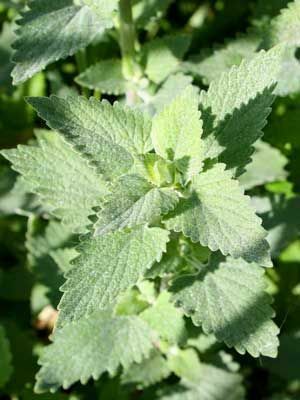 Catnip can be started from seeds sown indoors, or from a rooted cutting or purchased plant. Set out plants at about the time of your last frost. Pinching back in late spring helps to keep plants bushy and full, and it delays flowering. Catnip flower clusters are visited by numerous small beneficial insects. If you can, grow clumps in different parts of your garden. Gather sprigs as desired for the pleasure of your cats. One small stem tip with four to eight leaves is plenty for one or two cats to enjoy. Gather stems for drying in early summer, just before the plants bloom. Clip off spent blossom clusters to limit reseeding in your garden.